Joan Rose last walked through this gate at the Rochelle School in 1936 when she was ten years old. “I was quite happy at this school, though I turned rebel at eleven when I crossed Arnold Circus to Virginia Rd School, and I don’t know why.” declared the redoubtable Joan, with the casual recklessness that is her privilege at the fine age of eighty-four, now that (as far as we know) her teachers Miss Bell, Miss Faulkner, Miss Danielle and Miss Rees are not waiting on the other side of the gate to give her a good hiding. “I was ‘plainy plainy’ – ‘plain Joan’”, whispered Joan, revealing her childhood nickname. “Not a very nice person,” she confided, in amusement at her former self. Making up for lack of conventional good looks by demonstrating the independence of thought, the character and wit that have carried her through life with such buoyant spirits, “I got the cane a number of times for answering back,” she confided with a smirk. Now that sufficient time has passed, we can safely reveal the disgraceful incident with Miss Beany, the science teacher at Virginia Rd School. “After six weeks, I said, ‘Do you know Miss Beany, you bore me to tears? Every time I come to your class it’s the same thing with the bunsen burner and the flask which nobody understands.’ Then I turned to class and said ‘All put your pens down.’ My mother made me take a bunch of flowers to Miss Beany. And Miss Beany said, ‘Thankyou so much, sit down. Your parents are very nicely spoken – I don’t know where they got you from.” confessed Joan, still smarting from this putdown of seventy years ago though, pertinently, she herself grew up to enjoy a long and successful career as a teacher. This novel anecdote serves to illustrate how the class terror at eleven can become the most charming octogenarian you could wish to take a stroll around Arnold Circus with today. Brought up on the Boundary Estate until she was evacuated in 1939 at the age of thirteen, Joan is blessed with an astounding memory for names and details of her childhood, and she will cheerfully run through the list of every single one of her contemporaries in her class at the Rochelle School in 1936 if you ask – the neatest party trick I know. 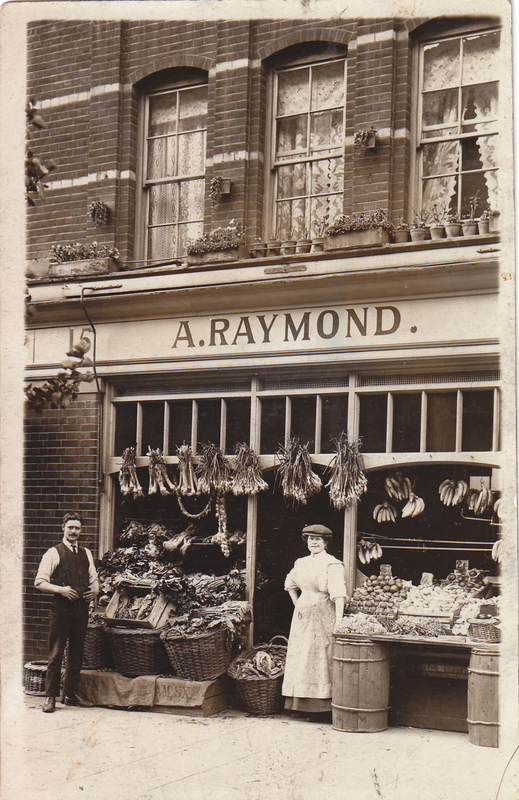 Joan Rose’s grandfather Albert Raymond opened Raymond’s greengrocers in Calvert Avenue (in the space that is now Leila’s Shop) in 1899 when the Boundary Estate was first built, and Joan’s father Alfred ran it until the nineteen sixties. 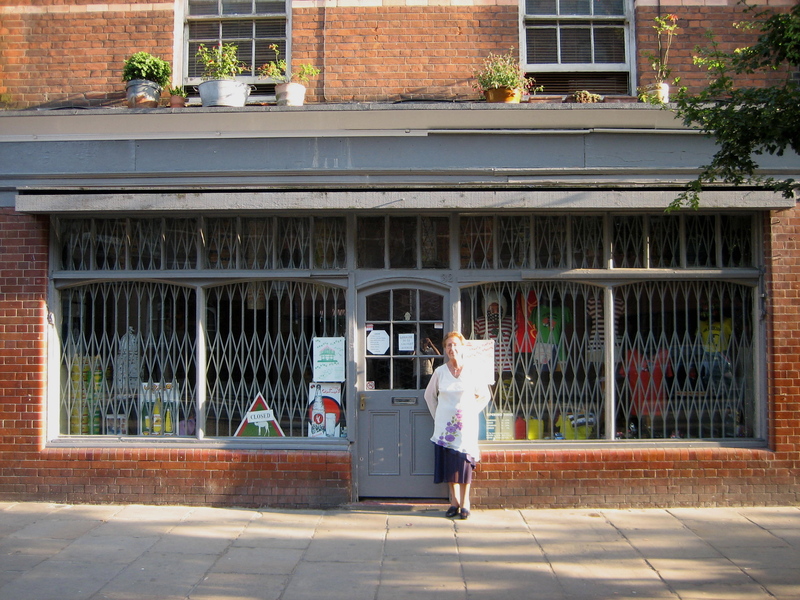 Joan is now patron of the Friends of Arnold Circus and – drawing a discreet curtain over her school record – she has been invited to cut the cake on the day of the centenary celebrations on July 18th. 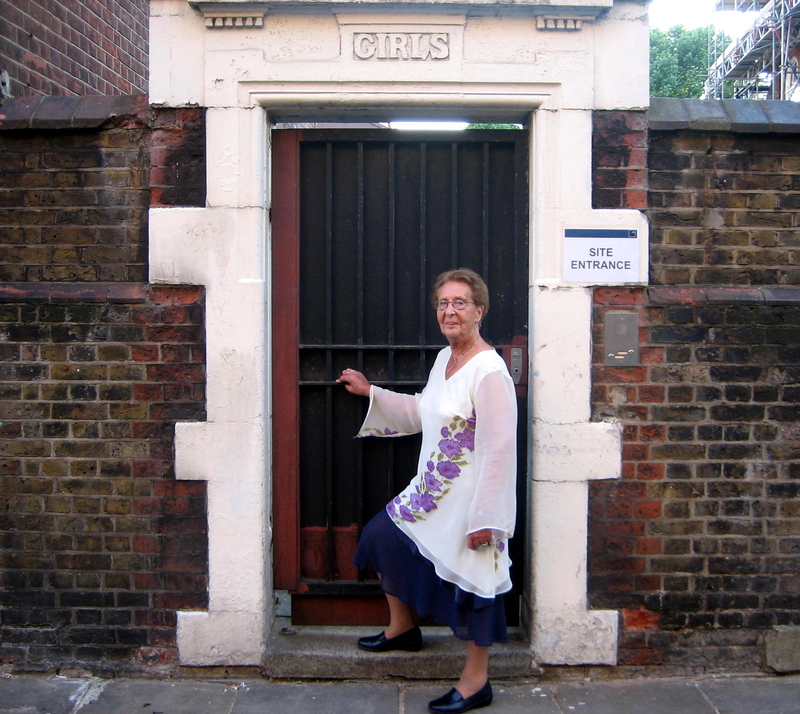 Through these snapshots published here, you are invited to join our stroll around Arnold Circus on a golden Summer’s evening – as seventy years fell away to reveal many of the cherished landmarks of Joan’s childhood as full of vivid meaning for her as ever they were. Joan Rose last bought fish and chips at this shop in Club Row in 1939. “Tuppence for a fish, a penny for chips, and a penny for a wally cucumber!” announced Joan, declaring her regular order to the closed door, and getting excited as the memory resurfaced of innumerable fish suppers she enjoyed here. Above this shop lived Kaplan the cobbler, who had a tiny premises round the corner in Old Nichol St. “If they were shut, you knocked and he brought your boots down to you,” explained Joan, recalling that this corner shop always sold groceries, a fact to which her father turned a blind eye, even though they were not a member of the Fruit & Vegetable Federation (that ensured grocers where evenly spaced), as he was. “This is where I celebrated the Silver Jubilee of Queen Mary and King George V in 1935. “ Joan told me proudly, “We had one long table the length of the yard and everybody brought food.” Joan lived with her family in the building to the right, Laleham Buildings, until she was evacuated in 1939 – which was fortunate because the flat took a direct hit. All the family managed to salvage from the rubble was their three-piece suite (“We had it recovered”) and their bedroom suite which Joan still uses today. 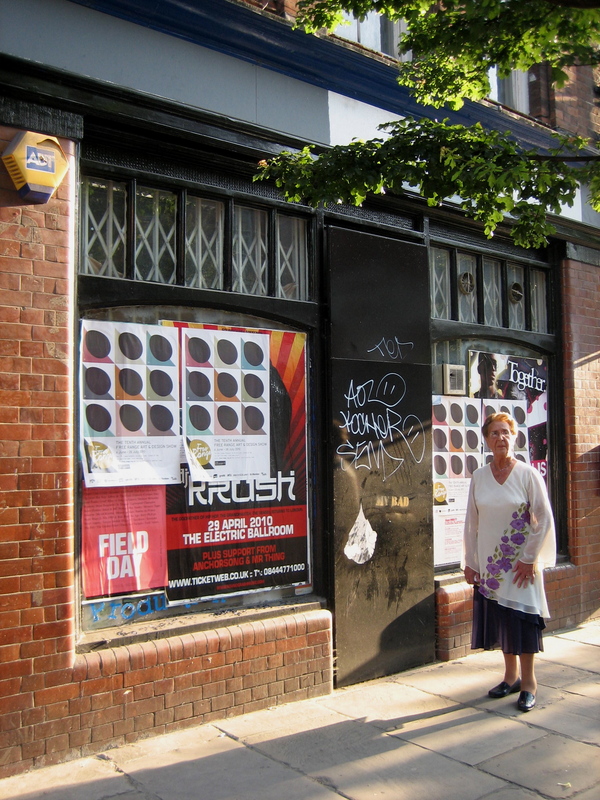 This shop in Calvert Avenue, which has been boarded up for years, is the site of Kossoff’s legendary bakery run by the uncle and father of Leon Kossoff the painter – Joan’s father signed the naturalization papers for the uncle. Joan remains full of wonder at the unforgettable quality of Kossoff’s baking, and the first bread slicing machine to be installed here, a fierce miracle of technology that cut off the finger of one of the assistants. The shop was so narrow that the bakers required an extension at the rear, and Joan and I walked round the back to discover the mark on the wall, revealing where the bakehouse once stood. 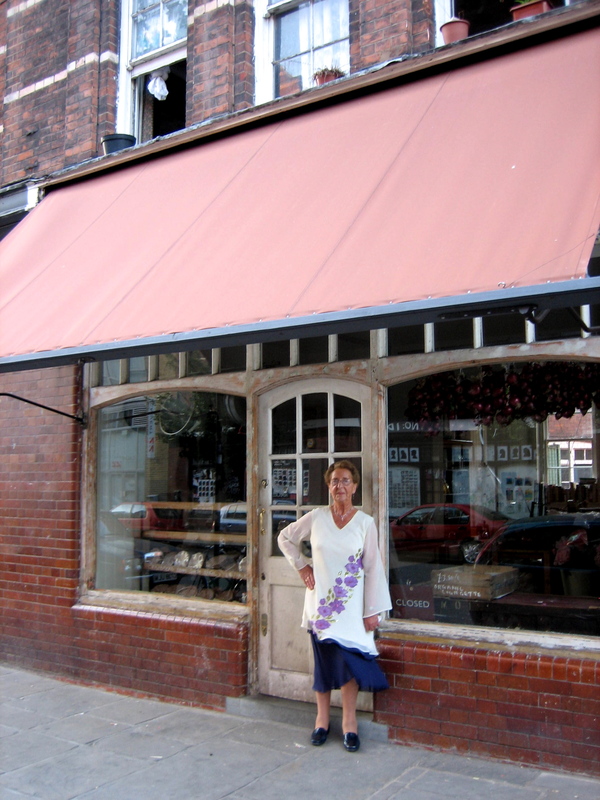 Joan remembers the Magnet Laundry, run in her time by Mrs Andrews, that occupied the left half of this trading space when she was five years old in 1931, because that was her very first bedroom window up above to the left in Cookham Buildings – before her family economised, moving round the corner to a flat with lower rent in Laleham Buildings. At the Magnet Laundry, dirty linen was differentiated into “best wash” and “bag wash,” the former being her father’s shirts and the latter being everything else. 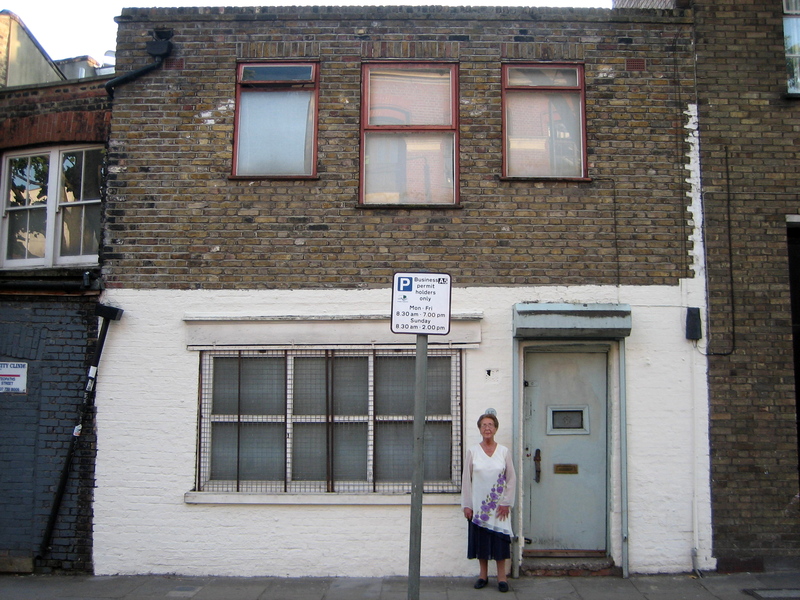 On Joan’s left was Lil’s delicatessen that sold delicious pickled herrings and beyond that the Rent Office (now the Community Laundrette) then Dr Murphy’s surgery before Kossoff’s the bakers. Phoebe Hannah Raymond, Joan’s grandmother, and grandfather Albert Raymond outside the shop in Calvert Avenue in 1899. At Phoebe’s funeral in 1936, Joan saw the first motor cortege (when horse-drawn hearses were still the norm), and every boy and girl from Virginia Rd and Rochelle school lined up on the bandstand to pay respects. Calvert Avenue was Joan’s first street and she knows every one of the premises and their occupants, seeing it all clearly in her mind. On one side of Raymond’s, the space that is now Leila’s Cafe was a confectioner. On the other side was a Welsh dairy (Lewis then Thomas then Jones), next Mendelbourn who made wicker furniture, next Feldman the tailor (now Ally Capellino) and Usiskins the furrier (now Guven Newsagent). One day after the end of World War II, a roasted peanut salesman pulled up in a van in Calvert Avenue outside Raymond’s shop and although Joan’s canny grandparents preferred to invest in a machine to roast their own, Joan was sold – because she married the handsome young salesman Ron Rose and left Arnold Circus with him to have her own family. 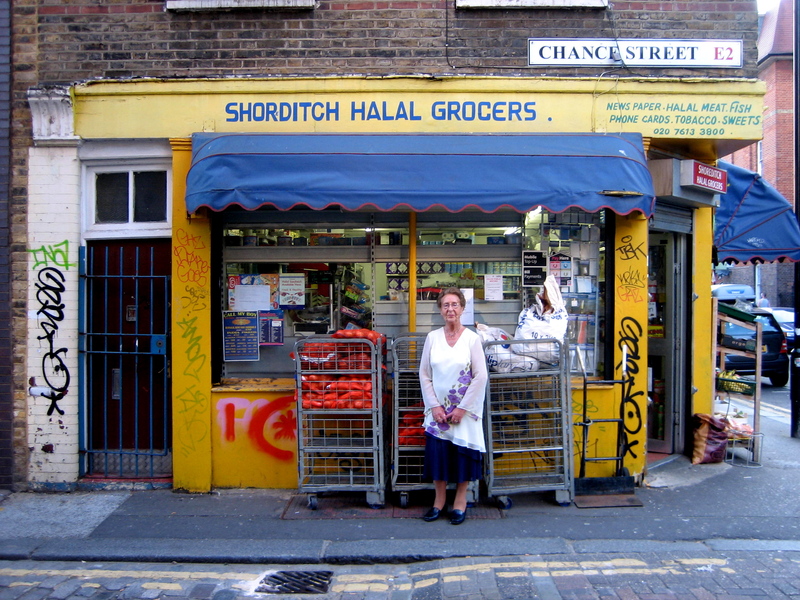 It was only in this century that Joan returned to discover her grandparents’ shop had been reopened selling groceries again. This was the catalyst that brought back all the memories for Joan and a new friendship too, with Leila McAlister. 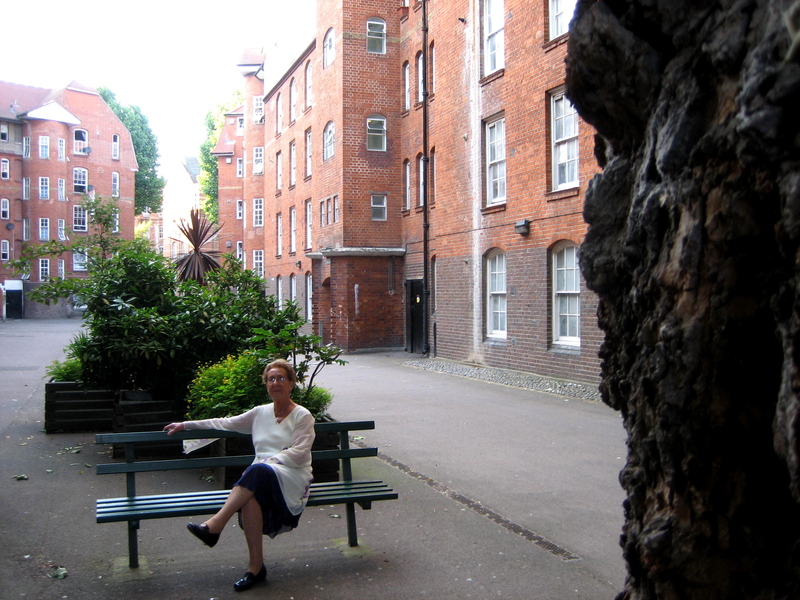 “When you get to know places they become bigger, that’s what has happened to me as I have got to know Arnold Circus all over again, even though it seemed small when I first returned.” said Joan, delighted to rediscover her spiritual home after all this time. Eating a St John’s doughnut at the St Bartholomew’s Fair a couple of Saturdays ago I remarked to my partner that while good it wasn’t quite as good as the hot ones we used to get from Kossoff’s every Sunday as kids. Dripping hot jam and sugary faces. I’ve never dared try a supermarket or chain one for fear of disappointment! Thank you for your memories of Kossoffs, Fantastic and never to be forgotten. Thank you for posting those wonderful photos, it brought back many lovely memories.I went to Rochelle St School 1929 Infants and then to the Juniors in 1932 -1935. Virginia Rd. School 1935-1938. Mr McHarry was the headmaster in Rochelle St. School and he caned me for talking while the whole class was talking.I got 3 on each hand and I fainted,I bet that shook him up. Neverless, your photos of your family and the shops in Calvert Ave are fantastic. Thank you. Joe Kaye in Los Angeles. I too got the cane from Mr McHarry. I can’t remember what I had done wrong, but I do remember that he used to shake. It was said that it was as a result of the 1914/1918 War. I also got a prize one morning at assembly. I don’t know what that was for either. My grandparents and parents loved to hear the children singing every morning from the hall. They could hear it in the shop. I can remember Kossoffs Bakeries doughnuts from the ’60s. Joan Rose, I wonder if you could be part of my family. My grandfather was Albert Raymond and lived in Tooting. He had 5 boys and 3 girls. Could we be related? I saw the BBC2 programme about Arnold Circus and saw ghd phogs of your grandfagthers shop..
As Raymond is not such a common surname it set me wondering. Samantha, I’m trying to find an Albert Raymond who was born 8 March 1932, he was my dad’s best friend, I don’t suppose you are related to him?